Have you been a Power Ranger fan since the beginning? Who's your favorite? Well, if you've been watching all these years your favorite has probably changed with the seasons. If you're a fan of the Red Ranger then you know that the character been through a lot of ups and downs through the years. While he's easily a favorite of Power Ranger fans in some seasons he is barely featured in others and it's hard to know what he's going to be like in the next season. There's Andros, a cool guy from a colony from outer space who maintains a nineties grunge demeanor. He's a pretty sweet guy but he's not above using his telekinetic powers to pour some hot sauce into his enemies milkshake. Just what a cool nineties grunge alien dude would do. Then there's the smart and tough red super samurai, Lauren. There had been female red rangers before but there had never been one on the side of good. When the Rangers thought they had done everything to defeat Xandred, Lauren found a way to make it happen! 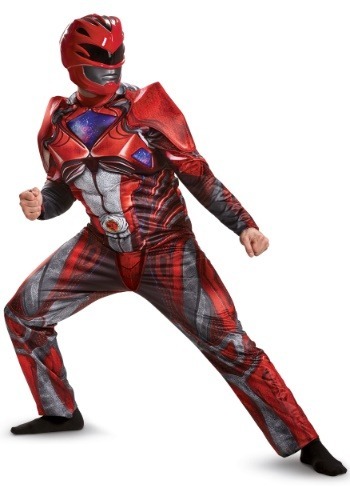 Whether you're a big fan of the newest Red Ranger or you're nostalgic for the Rangers of the nineties you'll have a great time in this Red Ranger costume. You'll prove that red is the best in this metallic looking jumpsuit. With galactic chest plate details, molded foam arm plates, and a hard plastic molded helmet with a large vision plate, you'll be able to face down your foes with ease. Whether you're going out for Halloween or having a showdown with some aliens in a field be sure to watch the "Forever Red" episode where all the Red Rangers come out at once. If anything is going to show you how to be the red character, it's going to be this episode!